Steelo is a Seattle-based R&B/Pop/Hip-Hop recording duo comprised of MC A.Uno, who is of Iranian and Mexican decent, and known for delivering rhymes in English, Spanish and Farsi, and singer Bobby K, who’s noted for his musical range and smooth delivery. From soulful acoustic ballads to party tracks, Steelo’s energy comes to life through their charismatic performances; their music is a lyrical fashion show of urban-pop styles that boasts vibrant colors and modern cuts. Steelo released their debut album “Music,” produced by hit-maker Fingazz of Streetlight Music, in 2009 and as a result, the group was added to the 2009 National Sneaker Pimps Tour in Los Angeles and Seattle, the largest traveling hip hop lifestyle and sneaker exhibition in the world, sponsored by Xbox and Verizon Wireless. Steelo has also appeared at Seattle Fashion Week and at a BMI showcase at the Knitting Factory in Hollywood, which aired as part of a special on NBC Mun2’s “One Nation Under Hip Hop.” In 2010, Steelo’s album was picked up by Japan’s P-Vine Records and released as a special version, which included the single “We On It,” exclusively in Japan. 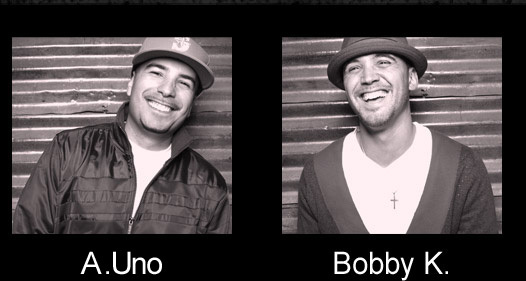 The group released a new EP “Neon Grey” in Spring of 2011, which features production by producers Illoquint, Happy Perez (hits include “Sure Thing” – Miguel) and Freddy Stylez. College radio embraced Steelo’s edgy and contemporary sound early on as a musical backdrop to study sessions and football games and they continue to be popular to the college-aged fan. Steelo’s single “Make Up My Mind,” a bouncy club anthem with searing R&B vocals and a party feel, was the #2 added record to national College Radio in it’s first week, second only to rap icon Nas. The song reached the #1 spot and remained in the Top 10 for five consecutive weeks. The music video for “Make Up My Mind” was added to rotation on NBC’s Mun2 network, MTV Tr3s, Eye Music Network, Official Heat Television and Foot Locker’s national closed circuit television. Steelo started their career on the Lowrider Car Show circuit opening for artist such as Baby Bash and Lil Rob, and they quickly discovered that their unique sound had a much more mainstream appeal – and that the ladies loved them. “Our fan base is mostly younger girls, they come to our shows to have a good time and vibe out to the music, we take it as a challenge to keep it fresh,” explains Bobby K. More recently Steelo has lent their talents to open for Pitbull, Sean Kingston, Rich Boy and Lloyd Banks. In stylistic contrast, the group’s first single “Let It Roll” was a smooth, feel good, summer cruising track. It was dubbed “a sure fire summer hit” by Wild 96.1 in Riverside, California and earned more than 400 national radio spins, including tastemaker-station Power 106 in Los Angeles and the increasingly popular Sirius Satellite Radio. Steelo understands their appeal to younger fans and as such they feel a responsibility to not only make music but to encourage them to follow dreams and live with passion. Steelo steps off the stage and into the classroom of many Puget Sound-area schools, connecting directly with fans and conducting a student empowerment program. They talk with classrooms about achieving personal and professional goals. The school-based workshop creates a dialogue and builds a lasting relationship with music fans, on a personal level. The group draws its name from the Spanish word estilo, which means style and the urban slang steelo, with the same connotation.